Departure Day! Today was a heck of a day, as one might imagine. First I drove over from my house on Caribbean Avenue with several huge trash bags containing the last of my stuff that had not yet been stowed on the boat. These I loaded onto the Texas deck (upper deck) along with the rest of my stuff that was already there. Then it was time to see if my tie-down scheme was going to work. Folding tables, storage bins, and big bags of stuff had to be waterproofed and tied down to withstand the motion of the ocean. Everything was quickly lashed down tight, then I tarped my stuff and Bert’s cordage supply to protect all of it from sun and rain. This was one of those times where my skill with knots and rope really pays off. Next, Bert and I drove in separate cars over to the foreign car repair place in Cape Coral where I dropped off my car to be sold on consignment. I was sad to see the car go. It served me very well for the past two years, getting me to West Virginia, spending two winters there, and then the trip back to Florida. On the way back we stopped and did a bit of final shopping for foods. After eating lunch came the big job of loading groceries, dry goods, and other stores onto Vagabond. Bin after bin was filled and stowed, items selected from the cupboards, refrigerators and freezers stripped. It’s quite a job and is something I’ve done before when Bert was departing but I always stayed behind and never left with the boat. This time would be different. Loading the stores is pretty much the last thing to happen before departure so I knew our departure was imminent, pending a last check of the weather and Bert making the final decision to go. Bert and Nancy stripped the last items from the house and came aboard. Bert went up to the wheelhouse to start the engine and I knew the moment had come. Stu Carlyle dropped by to release the dock lines and see us off. We backed away from the dock, into the canal, and with a blast from the air horn we turned to port and entered the Caloosahatchie River for the trip downriver to the Gulf of Mexico. We just passed the Highway 30 Bridge over the Caloosahatchie River. Notice that the water is brown. It looks like like tea. Most low-elevation tropical rivers are like this because of the tannins that leach out of the mangrove trees that line the shores. Click to view larger. Railroad bridge over the Caloosahatchie River, East of Fort Myers, raised for us to pass. Click to view larger. The Koden radar is a wonderful thing. I installed it about four years ago, replacing an older unit. Older radar units transmit a lot of power so it’s impolite or prohibited to use them in close quarters because they interfere with radios, telephones and can upset computers. Here, the Koden is running on very low power and short range, so we can see everything on the river and the banks of the river, in fine detail without upsetting anything around us. Click to view larger. The trip downriver was interesting. I was curious to learn how Bert handled the daytime pilotage problems of the Caloosahatchie River. 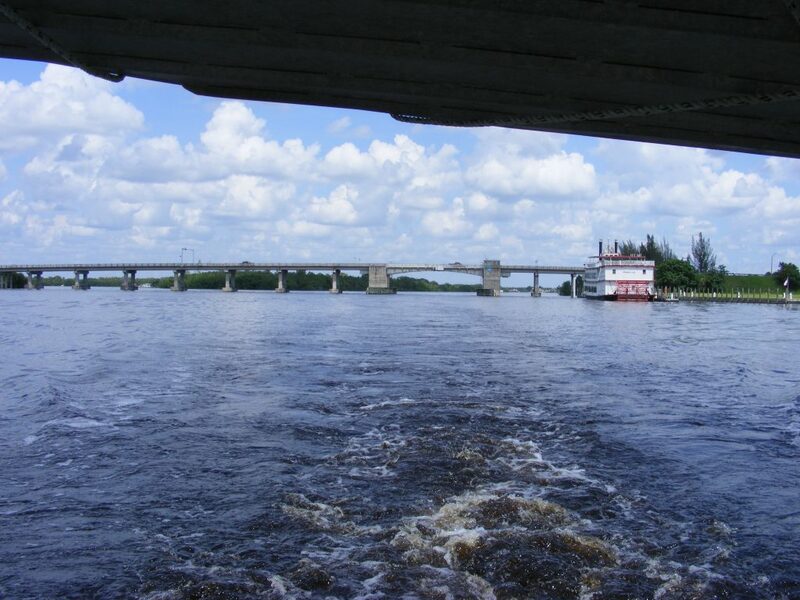 He and I had sailed on the river many times before but not past Fort Myers. 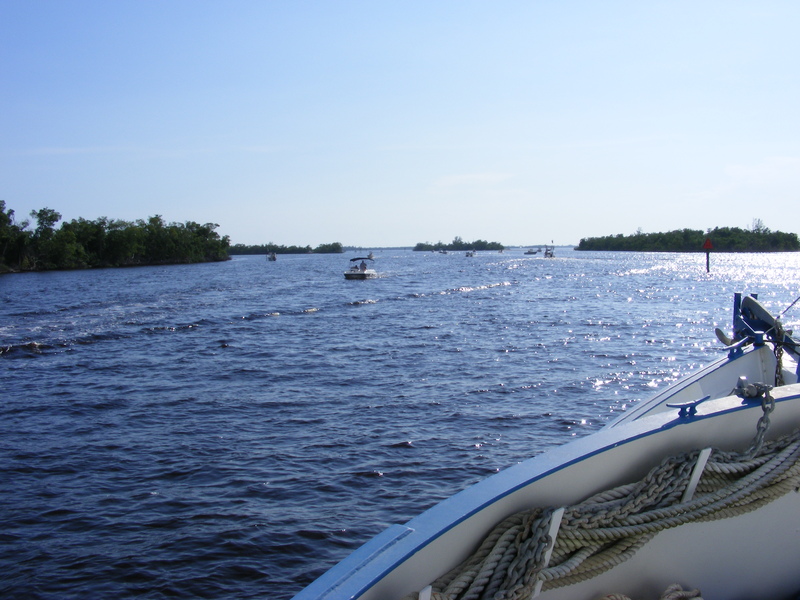 The river is wide but shallow and only a narrow channel approximately down the center is dredged deep enough for boats. The channel is marked and in a couple of spots is so narrow that a traffic jam of small boats builds up and it can get pretty crazy. 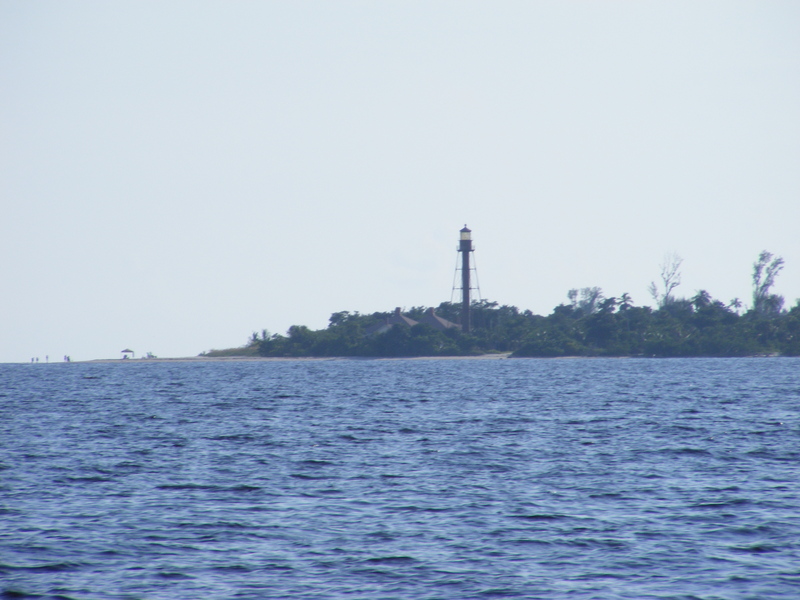 After cruising downriver for several hours, with the sun low in the sky, we reached the lighthouse at the tip of Sanibel Island and the open ocean of the Gulf gradually grew wider and wider before us. The imperceptible light chop on the river widened out to longer but very gentle swells. The sea was almost flat so the motion of the boat was near zero. There was no need to lower the birds (stabilizers) so we steamed at full speed on a direct course for the Dry Tortugas. 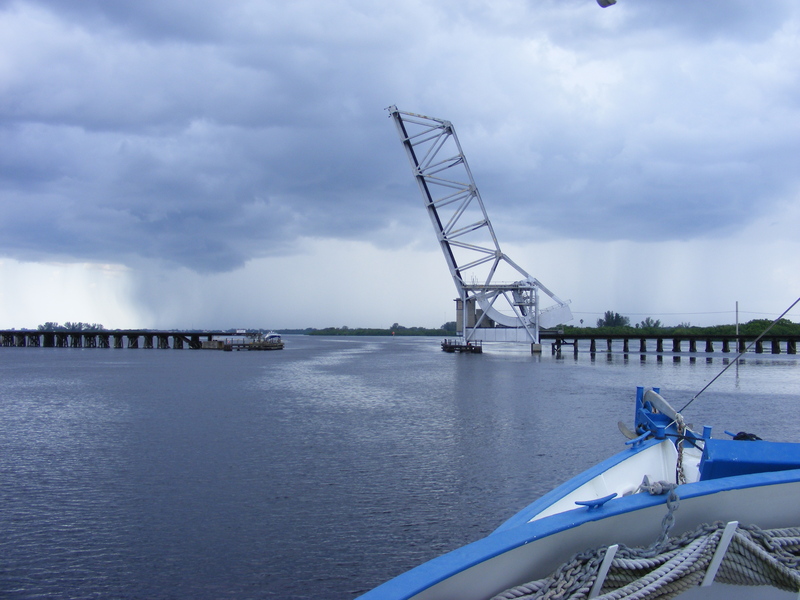 Tropical Storm Fay had just finished spending several days in our area and we knew this would calm the seas. Hurricane Gustav was threatening but we chose to go anyway and enjoy the greater comfort and greater speed that we can achieve in the flat seas between storms. 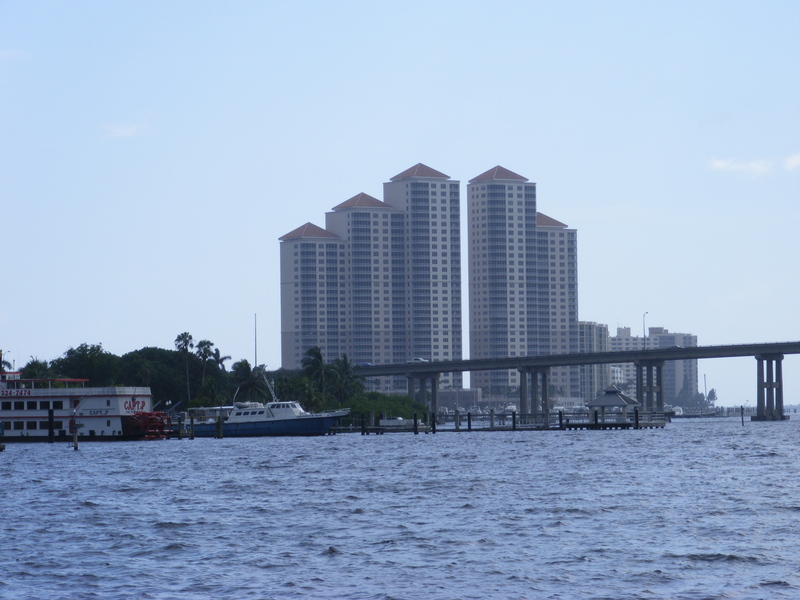 Fort Myers, Florida. Click to view larger. Here’s one of the narrow channels of the Caloosahatchie downriver from Fort Myers. The river is wide but very shallow. 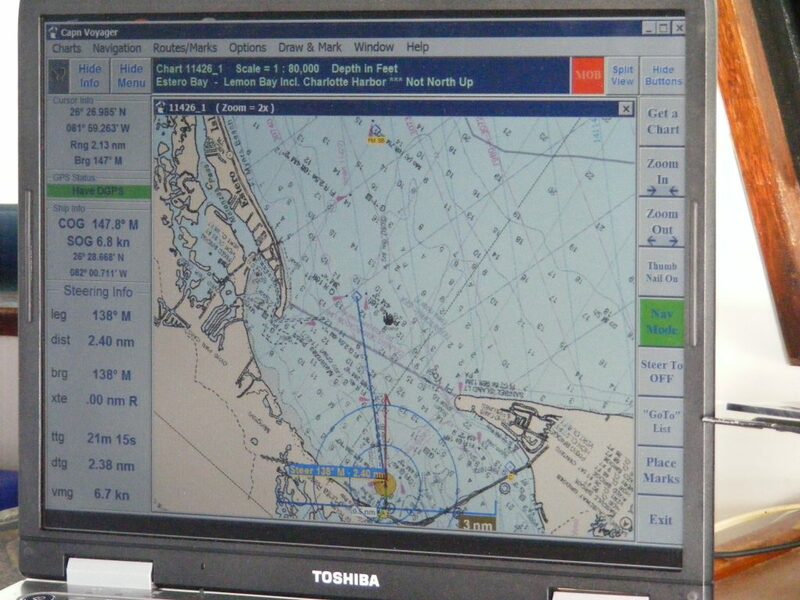 Channels like this one are dredged to allow larger boats to navigate. But the dredged channels are very narrow. This photo doesn’t show it but traffic is heavy here and some boaters are not skilled or are drunk. Blowing the horn is necessary to keep the chaos in order. Click to view larger. The engine is running a few degrees warmer than normal and high enough to set off the temperature alarm. Adding water to the overflow reservoir did not help so I set the alarm about 4 degrees higher to stop it from sounding while we thought about the possible cause. 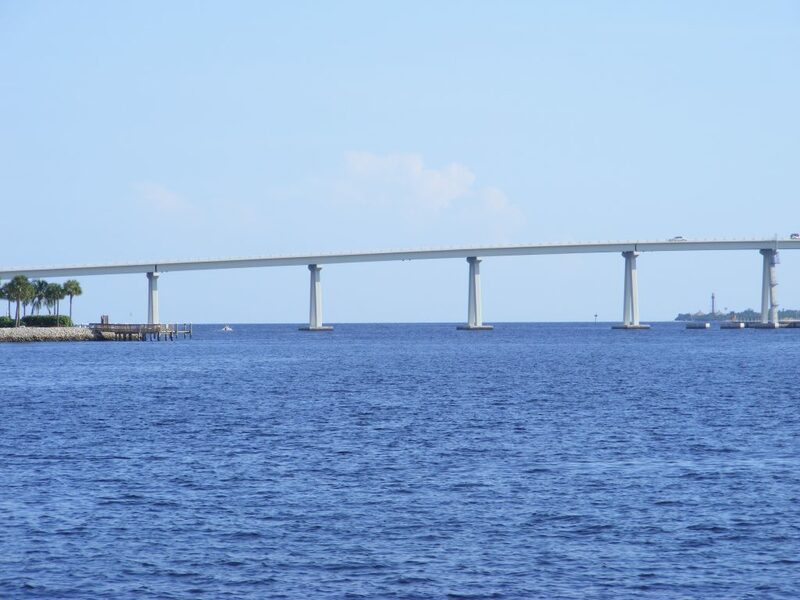 Sanibel Causeway crossing the Caloosahatchie River. Click to view larger. Sanibel Light, Sanibel, Florida. Click to view larger. After dinner Nancy took first watch. We were all exhausted from the labors and stresses of the day. It 11:30 PM Nancy burned out and I took the watch. I was so tired it took constant effort to stay awake. After years of service the watch clock on the bridge failed so staying awake took constant effort. (A watch clock sounds every ten minutes to make sure you stay awake.) Fortunately, Bert got up at 2:30 AM and relieved me. I was exhausted. 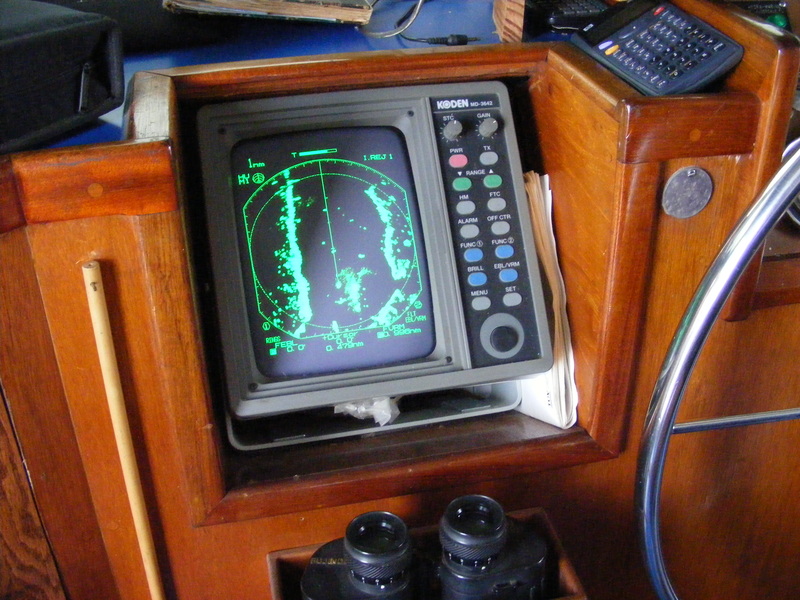 Navigation computer on the bridge of M/V Vagabond. Click to view larger. We finally exit the Caloosahatchie River and reach the open sea. 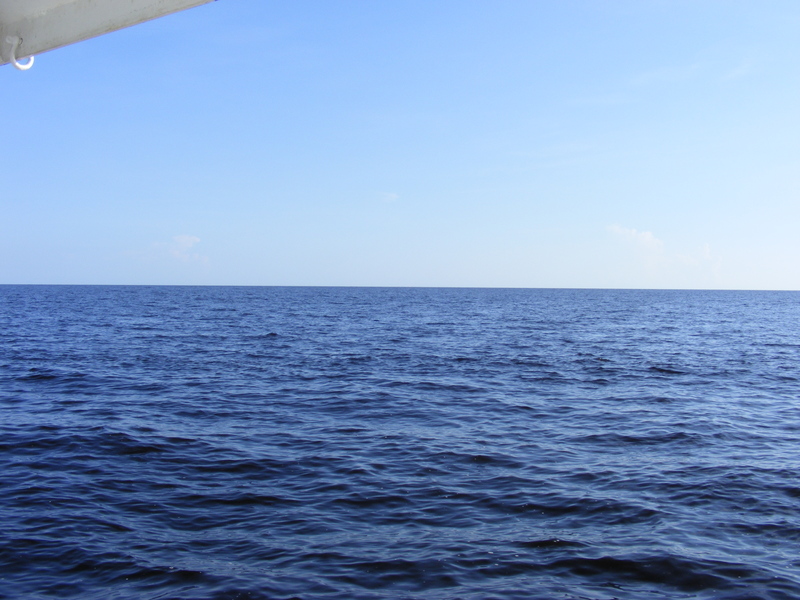 I was thrilled to finally be on the sea again, with empty horizon before me.